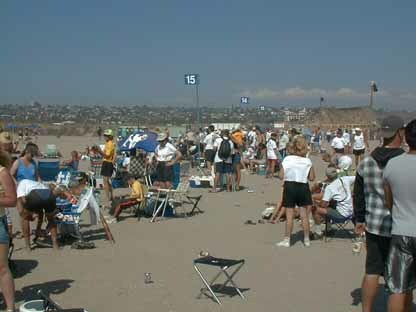 Each year hundreds of teams via for the "Over-The-Line®" championship that is played out in San Diego in the tournament sponsored by OMBAC® "The Old Mission Beach Athletic Club®". To most people OMBAC has the reputation of a bunch of hard partying beach rowdies... OK that's true but they also hold fund raisers such as the "Over-The-Line" and the "The Coming-Out" party that finance various charities. One very ambitious charity is to donate "Beach Access Wheelchairs" to all lifeguard stations on the west coast of the United States. Keep up the good work guys! The ball is "pitched" by a team member who kneels in front of the batter and then the pitcher quickly moves back to allow the batter a full swing. Keeping your "eye-on-the-ball" is just as important here as in major league baseball or softball. And getting a good hit is like being on top of the world! There are always a lot of well planned and great private parties. Hundreds of Teams and Thousands of Spectators. but they're really a great bunch of fun loving guys! Yes, and the names of some of the teams are a little bold, but hey it's for fun and charity. And besides the athletic competetion there are the beautiful people. Ms. Emerson (in the center) and her "Court". 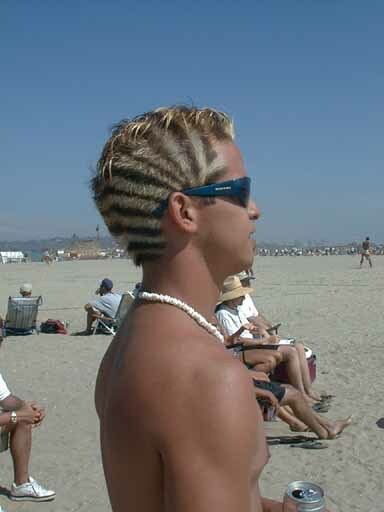 This guy swore that this was his natural hair color... and you know, I'm inclined to believe him! The "Mosh-Pit" at OTL! This guy didn't think I was from a real magazine... well I guess he's in for a surprise. of Old Mission Beach Athletic Club, all rights reserved.